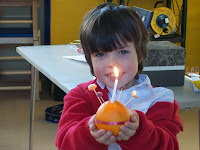 Since our blog began in November, lots of great things have taken place at school. The image below was created using Wordle; it shows the most common words used on our blog by size, with the largest being the most widely used. I think it says a lot about our school! This year's annual talent show was a lot of fun, with acts including a puppet theatre, magic show, dancing, singing, plays, gymnastics and a surprisingly large number of ninja warriors! Mr Pearce led the school in a rousing chorus of The Twelve Days of Christmas today, complete with actions! Here are some of the highlights! Children, staff and governors enjoyed a traditional Christmas dinner today. Thanks to the Year 6 pupils for serving, and particularly to Rachel, our cook for all her hard work. She is leaving us on Friday for pastures new, and we wish her all the best for the future. 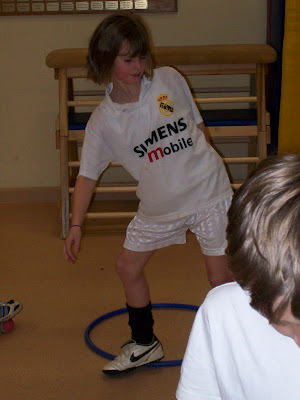 Yo, Yo! Pearcey in da house, innit! This year's Christmas carol service was a great success. There was a huge turnout of children and parents and it was great to see the church full to bursting. The evening began with the recorder group playing We Three Kings, in parts. The children read and sang beautifully and even the staff had a part to play, with their debut performance of Silent Night. We are delighted to announce that Earl Soham Community Primary School has gained the 'Activemark' award. This award is given annually to reward the delivery of the national PE, School Sport and Club Links strategy. More than 90% of our pupils take part in at least 2 hours high quality PE and School Sport a week. Well done to all children and staff involved in achieving this award - it is thoroughly deserved for everyone's hard work, but more importantly the enjoyment shown by the children when taking part in a wide range of activities both in and out of curriculum time. 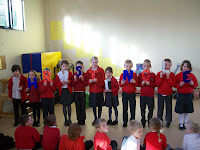 A group of children from Yellow Class have been making up their own brand-new Fairy Tales this week in Literacy. They wrote a script and dramatised their story in Friday's sharing assembly. 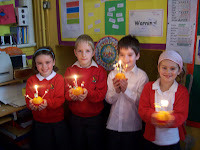 In this morning's assembly, we looked at 'Christingles'. Mr Pearce made one and then everyone learnt about what they actually are and what they mean (they originate from Germany about 250 years ago and stand for 'Christ's light'. Originally, they would have been made using nuts and dried fruit, more modern ones generally use sweets. Back in Yellow Class, 27 children had a great time putting their Christingles together, whilst not being tempted to have a sample of jelly tots or dolly mixtures! 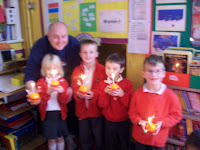 We briefly lit the candles - the effect was lovely. At time of leaving school, all sweets were still intact on the sticks!